When was the last time you made a wish, and really felt as if it could come true? Every child blows out birthday candles or tosses pennies into a well, and not only makes a wish, but also genuinely believes it’s likely to become a reality. Then adulthood happens, and belief in things of that nature generally tends to fade. A new product is in the works that seeks to recreate this experience for adults, and rekindle the belief that wishes can come true. 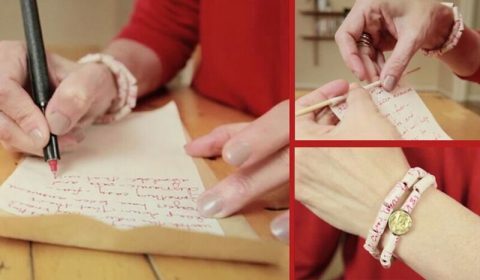 Known as Wishbeads, it’s a unique arts and crafts kit, and is the brainchild of Santa Monica resident Alexa Fischer. Wishbeads comes with a 21-day action journal, complete with prompts to enable the wearer to start seeing elements of his or her wish in action. The theory behind it is that if you focus on something hard enough, the law of attraction will bring it to within reach. Wishbeads claims to be able to aid in doing this, and help the wearer to manifest exactly what he or she wants from life. According to Fischer, making the bracelets is also a fun activity, and can provide a great bonding experience for women if done communally.